Odessa, Florida (February 6, 2019)—Just seven months after announcing they would establish a presence in Pasco County, TouchPoint Medical’s team broke ground on the new 142,000 square-foot facility at the parcel located just off the Suncoast Parkway and SR 54. 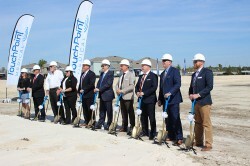 “We are so excited that we are about to start construction on the largest investment ever made in our 120 years of existence right here in Pasco County” said Pascal Testeil, President of TouchPoint Medical Inc.
TouchPoint Medical partners with Medical Technology and Healthcare Providers to provide safe and efficient mobility for medical and information technology via innovative stationary and mobile carrier systems. In addition, TouchPoint Medical is a leading producer of automated medication dispensing equipment. TouchPoint Medical businesses provide value added products and services to hospitals and health care facilities in over 70 countries. “We are thrilled TouchPoint Medical Inc. chose to build their new facility in Pasco County,” said Bill Cronin, President/CEO of Pasco EDC. “It’s our privilege to be a part of this new venture’s growth and their decision further reinforces that Pasco County is a great place to start, move or grow your business”. TouchPoint Medical focuses on enabling safe, secure, and efficient environments for patients and caregivers through the utilization of technology. We employ approximately 400 employees all over the world, including USA, Germany, UK, Belgium, Norway and China. This new location in Pasco County will serve as our Global Headquarters. For more information, visit www.touchpointmed.com.